Pets Costs > Cat Breeds > How Much Does a Persian Cat Cost? How Much Does a Persian Cat Cost? A Persian cat is a long haired cat that is known for its round and flat fronted face. These cats have an extremely thick coat compared to other cats as well as shorter legs. Known to carry a wide variety of coat colors, these cats are favored by many breeders worldwide, making them one of the most popular breeds in the United States. The cost of a Persian cat depends on the breeder, the rarity of the coat color, its facial structure, the gender, the quality of the cat, age, breeder and geographical location. How much does a Persian kitten cost? Show quality cats are going to be more toward the higher end, while cats with defects or a non-champion bloodline will be near the lower end. Also, cats with a rare color or pattern can fetch a higher price tag as well. While these types of cats can be found at local shelters, they will usually be older. If found at a local shelter, the placement fees can range anywhere from as little as a small donation to less than $200. Cat Breeds List says the average cost can be between $500 and $700. PetHelpful.com says most breeders can start their prices at $800 for a healthy kitten. According to The Persian Kittens, Persian cats will cost more on the east coast and in the midwest than they will in the south and west. With anything you purchase in life, the geographical location will play a role. During the winter, most cats won’t be in heat, leading to fewer litters on the market. This, of course, can create more demand, increasing the costs. A reputable breeder will always register their cats, but if they withhold this registration, it may mean the kitten has been altered. A health guarantee will protect your investment upon adoption. Even if one is included, it will vary from breeder to breeder. Since this breed is known to have genetic problems, a reputable breeder will test for these issues. If any problems were to be found, this could affect the costs. As we explain later, a Persian can come as a solid color, bicolor, tabby, color point or parti-color. Some colors will be popular with breeders, and depending on your market, the prices for certain colors will vary. Reputable breeders should include a health guarantee that lasts up to 90 days, and this is going to protect the person adopting from paying vet bills if the cat has any health problems. This will allow them to either return the cat or have all the vet bills paid. They should also include up-to-date vaccinations and a travel crate if being shipped. Depending on the breeder, some may spay/neuter and include a microchip. Be sure to ask the breeder about the inclusions as all breeders will have their own inclusions. If the cat has to be shipped through an airline, a shipping fee can start at $150 to $350. This will depend on the airline and how far the cat has to be shipped. Local registration may be required in your local city if needed. Check with your city to inquire about the local law. Startup supplies that you may need will include items such as a litter box, cat toys, food, litter, and medications such as a flea collar and heartworm treatments. Don’t forget the recurring costs such as food, cat litter and routine/unexpected vet visits. The average cat owner can spend $700 to $1,100 per year. Frequent grooming is required since the coat is longer than most other cat breeds. To keep the coat in top notch shape, experts recommend you take your feline into a groomer at least once every few months. The average cat grooming session can cost about $55 to $95, depending on where you live. Its coat is known to be glossy, long, silky and can come in the following colors: white, black, blue, cream, red and chocolate. However, gray and beige will be the most common color you will see on the market. Persian pet owners say this cat is known to be quiet, loyal and very affectionate, making for a great lap cat. There are two popular types of Persians: the flat face and the traditional. Americans will be most familiar with the flat face variety, but the problem with type is that they are prone to nasal and eye drainage problems. 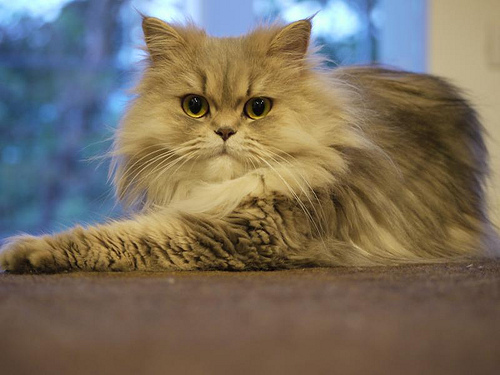 A traditional Persian will have a face that isn’t as flat and won’t cause as many drainage issues. Generally, the flatter your cat’s face is, the more problems they may have. These breeds tend to have a long thick coat and shorter legs, and due to their stature, they are prone to a lot of health problems such a sinus and breathing issues. If healthy throughout its life, the lifespan can be anywhere from 13 to 16 years. If you’re looking for a show quality Persian, consider going to a local CFA cat breeding show. Here, you can mingle with other breeders to discuss their upcoming litters. Check with local breeders since this will allow you to save on the shipping fees. It also gives you the chance to check the cat in person to see if you get along with it personality wise. Older cats can commonly be found at shelters such as the Humane Society. Check these shelters on a weekly basis to see if any Persian cats have come in for adoption. Adopting an older cat can save you a lot of money and offer the cat a loving home.